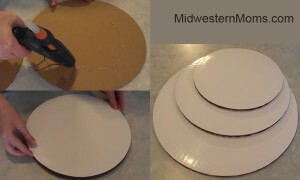 Cake Circles – I used a 12 inch, 10 inch, and 8 inch. You will need 2 of each size. Short Foam Cylinders – I used 2, these will be the base for your stand so you will want it close to the table or counter top. 2 Soup Cans – These need to be full, not empty. The first thing I did was glue the 12 inch Cake Circles together. Make sure to leave the white sides on the outside. Repeat this for the 10 and 8 inch Cake Circles. These will make the tiers of your stand. 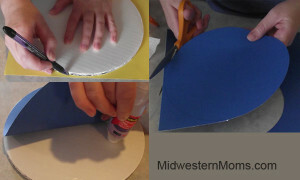 I traced the Cake Circles on to the backside of the of Scrapbook paper to cut them to size and Glued them on. If you want, you can skip this part since the Cake Circles have a white coating on them. I then used the Hot Glue Gun to put the ribbon on each layer and this completes the tiers. Now for the base, I used 2 short Foam Cylinders. If I would do this again, I would make it 3 or 4 cylinders to make it more sturdy. 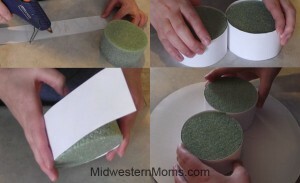 I used White Scrapbook Paper and cut it to go around the outside of the Cylinders. 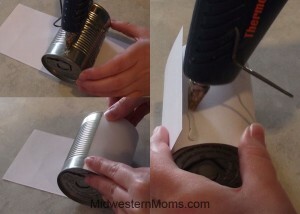 I used the Hot Glue Gun to attach the paper to the cylinders. I then attached the 2 cylinders together so they made a wider base. I then attached them to the bottom of the 12 inch Cake Circle. For the columns between the tiers, I used soup cans. I removed the labels and measured the cans. I cut white Scrapbook Paper to go around the cans. I attached the paper with the Hot Glue Gun. I placed a soup can in the middle of the 12 inch Cake Circle and place the 10 inch Cake Circle on top of that can. Do the same for the next tier. I did not glue the soup cans to the Cake Circles. I wanted to be able to use the soup for a meal at a later date. 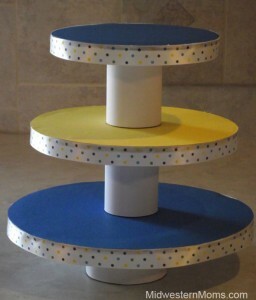 Your cupcake stand is complete! 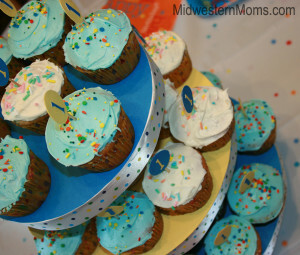 Now all you need to do is fill your cupcake stand with some cupcakes! !